Not to be confused with Canopy Cannons. Canopy Chaos is the third level of Donkey Kong Country: Tropical Freeze, located in Lost Mangroves. It takes place in a rainforest area. In Time Attack mode, a time of 1:18.00 is required to get a gold medal, a time of 1:38.00 for silver, and a time of 1:45.00 for bronze. The level starts out in a rainforest similar to the one seen at the end of Shipwreck Shore. DK and Dixie Kong will go through it until finding another barrel, this one with the ability to bring in Cranky Kong (who switches out with Dixie). A Tutorial Pig will then inform the player that they can bounce on surfaces by double-tapping the A button, which can sometimes break or hammer down objects. 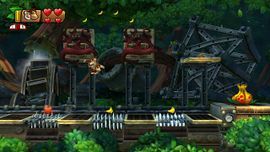 After defeating an Archy who shoots flying fishes, the Kongs will bounce up a series of treetops leading up and containing enemies such as Monocle Monicas, Wild Wendells, and Archies, followed by some Barrel Cannons that blast them to a new area, this one similar to the forest below, except with several spike platforms that can be avoided by using the bounce move. At a waterwheel-powered sliding platform, like the one where the letter "K" was found, a Tutorial Pig will remind the player that they can avoid and go under objects by doing a roll. After avoiding a row of spinning fans using the move, DK and Cranky use more Barrel Cannons to get to a higher area with a checkpoint and more treetops, as well as several Thug Slugs and the last letter. Following another series of cannons (where the shot must be timed correctly to avoid hitting a spinning gear), the Kongs will go to a platform with the Slot Machine Barrel, ending the level. Cranky or Dixie Kong are required for this secret exit. At the end of the level, Cranky or Dixie will need to utilise the crate on the right and high jump to the platforms above the Slot Machine Barrel. A hidden area with a portal will reveal itself once high enough. Through the portal is a small room containing the secret Slot Machine Barrel. Of note is that Cranky Kong's phonograph from the original Donkey Kong Country makes a reappearance in this hidden area. When a ground pound is done near the phonograph, it starts playing the main theme of the arcade Donkey Kong. This is a nod to the opening sequence of Donkey Kong Country. K: On the waterwheel, jump must be timed correctly to get it. O: On the small treetop, below where the enemies start. N: In between the vines and Monocle Monicas in the second jungle area. G: On the vine in the third jungle area. After jumping on the first Wild Wendell and throwing its shell into the rock with the Plump Yellow Fruit, it will reveal a secret area with several bananas, and will give the player the first Puzzle Piece if all of them are collected in 30 seconds. Before jumping on the treetops, the second piece is automatically revealed behind the spikes by going towards them, they can be avoided by bouncing. On the highest treetop platform, pops out after pounding next to the Plump Yellow Fruit on it. In the suspended bag right after the vines, obtained by throwing a Wild Wendell shell into it. Revealed from the rocks high up above the treetops, in the area which has a lot of Thug Slugs. In the secret area found after jumping above the rock cliff after the one where the previous piece was found, received after collecting all the bananas there. On the platform above the Slot Machine Barrel. This page was last edited on December 14, 2018, at 11:51.